residency Mimar Sinan Universtity: 26 March - 15 April 2017 - Clement Layes has been invited by Mimarsinan University (Istanbul, Turkey) to organise a workshop around his performance The Eternal Return. return in the wheel of the cosmic process. In “The Eternal Return” Clément Layes and a group of collaborators use the theatrical apparatus to stage the different collective and individual rhythms we live by. In doing so, the performance aims to explore how we establish and maintain our singular and collective identity through the creation of rhythmic narratives and how, in the process of creating these narratives or refrains, we are always dependent on other individuals, things or rhythms. As such, the eternal refrain aims to lay bare the fragile and on-­‐going polyrhythmic process that lies underneath our subjective, objective and collective temporalities. To do this, “The Eternal Return” will work with repetition and accumulation: repetition of movement and accumulation of people. 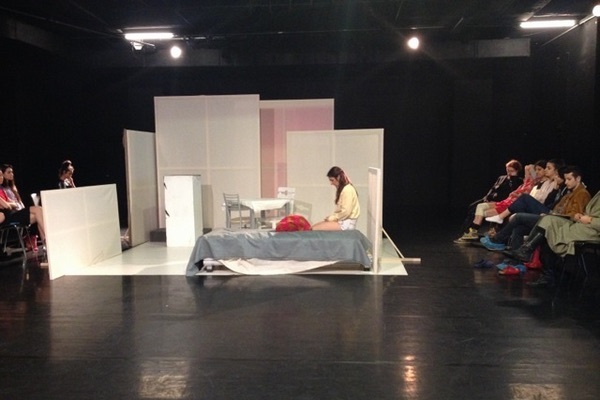 During the performance, fifteen people will enter a small room one by one. Each person will have their own course. Once they’ve entered, each person will stay and repeat their sequence. As the number of people starts to increase and form a crowd, these repetitive actions will start to intertwine and syncopate with each other, thus creating a plurality of possible temporalities and singularities. The attention of the audience shifts here, from the actual performers and their actions to the rhythmic relations that unfold between the performers. “The Eternal Return” will premiere in Berlin’s Sophiensæle on October 5th, 2017 with fifteen local artists on stage. A core team of seven performers will go on tour and invite eight local performers to join them: after a short workshop and rehearsal period of five days, an individual version of the choreography is being presented. Like the moment of repetition never remains the same, “The Eternal Return” keeps on changing its shape and is refueled by the different contexts, it is performerd in.